Soha Ali Khan, the daughter of Mansoor Ali Khan Pataudi and Shamila Tagore is an intelligent selebrity in Tinsel Town who has had good roles in character movies unlike her elder brother who has always been in commercial films. She has her birth anniversary on 4th October 2008. Ganesha takes a snap of her horoscope to see what is in store for her in 2009. Sun and Budha in her ascendant indicate that she definitely is a person of self esteem and ego as well as high level of intelligence. She is calm and patient as well as down to earth because she has Sun in the second Decante. Mercury in the second decante leads her to a stable and confident intelligence. Mangal and Sukra in conjcuntion in her natal chart with Chandra provide her with charm and beautiful eyes. In the coming year from her birthday in 2008 to her birth day in 2009, she will have transiting Ketu trine to her seventh house of public image and trine to its own natal position and in conjcuntion with natal Guru, the lord of her public image. 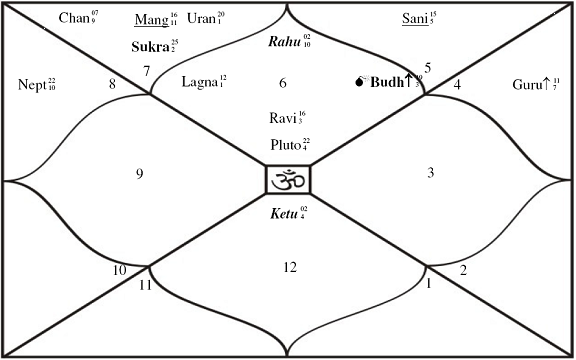 Transiting Rahu will be trine to her natal Surya and Budha. Budha is the lord of her sun sign and the lord of her tenth house of career. Transiting Shani will aspect her second house and natal Sukra and Mangal as well as natal Chandra. Ganesha thus feels that the first thing that may happen through out the year is negative publicity. She may face a lot of flak from the public and her public image may take a beating. There are chances that her usually sharp intelligence may be eclipsed leading her to a make some foolish remarks in public inviting a wrong impression. She should be careful in the coming year. Ganesha also finds that her marriage issues may get complicated and any relation that she is in may not work out and she may have a heart break too. There are indications that she may get into a tussle with her big brother Saif Ali Khan. On the positive side, Ganesha finds that she will get a couple of good big banner commercial films. The following are important periods for her to be careful about any remarks or action. Second half of November 2008, first half of January, Mid of April and Second half of September. Unfortunately the year seems to be tough on her a fated year. May Lord Ganesha bless her.